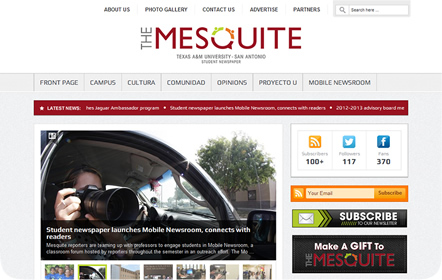 Mesquite News is the student newspaper for Texas A&M University San Antonio that aims to challenge, prepare and empower students throughout their college years and beyond. 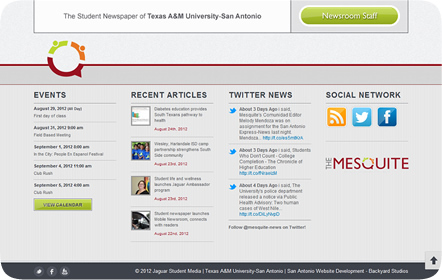 Supported by the School of Arts and Sciences, Mesquite News offers the latest news within the campus and the San Antonio community at large. 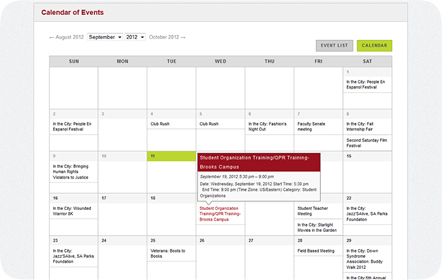 Students work with the professionals of San Antonio-Express News, Univision, La Prensa and NOWCast to ensure the latest and most accurate news is provided. 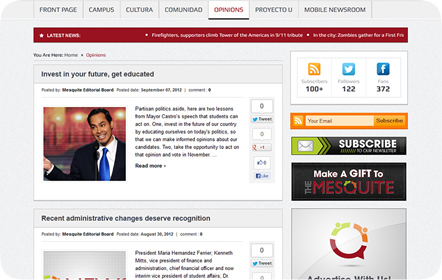 As part of a relatively new university in San Antonio, Mesquite News wanted to compete with the larger universities of the area. A total rebrand with a cleaner, more professional look was implemented for the student newspaper, starting with a brand new logo. This became the basis for their completely revamped website with a tremendous focus on the community and the student journalists. With the tagline “Your Campus, Your Cultura, Your Comunidad,” we knew it was essential to attract not just the students but the Hispanic community of San Antonio. 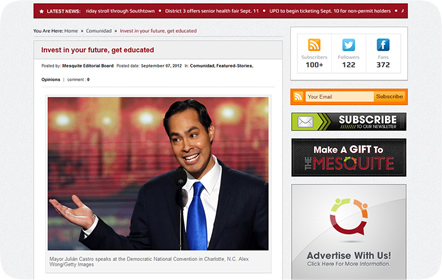 The articles, which cover every aspect of the local community, can be shared easily on Twitter, Google+ and Facebook through the links included. These social media accounts were skinned to match the website, while the same branding elements crossed over to their business cards, press passes, bookmarks, signage and note cards. All these pieces that stemmed from the new brand left the client very excited for all the future possibilities with Mesquite News.